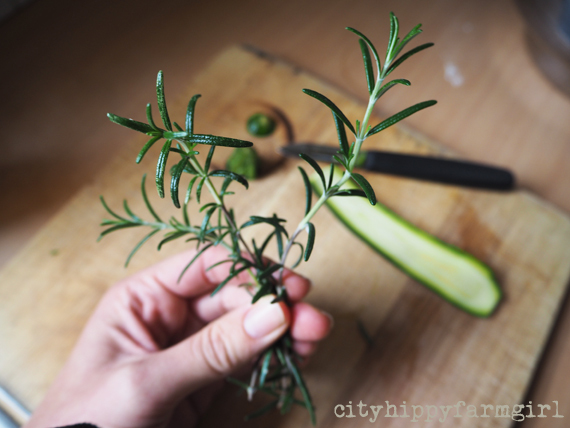 This entry was posted in Connecting with Community, Food Glorious Food and tagged eat local challenge, locavore, organic, rosemary thyme and zucchini bread, slow food, sourdough, sydney by cityhippyfarmgirl. Bookmark the permalink. Yay you’re using salt from near me! It’s my favourite! I really love this series Brydie! No other salt even comes close Lila! Spectacular! It’s funny, I just watched the Great British Bake Off last night and it included a similar bread. Wagon is rolling Laura. Jump aboard. And your bread sounds lovely. Hummus and za’atar are always delicious on, well pretty much everything. I love the eat local series too – how do I join in? Emma just jump in! Just have a read of the last part of this post and see what you can do and how you want to do it. Link back to me, and to one of the Eat Local posts as I’d love to see what you make! I am glad you can’t keep away from the bread – I love seeing your beautiful loaves – and it reminds me I must check what local flours are available down my way. Lucky you aren’t on instagram Johanna, it’s a sea of bread shots in there….and thank you. I try to buy local-ish anyway and I’m getting such great veggies from the farmer’s market at the moment, I’ll have to give this challenge a try… Thanks for the inspiration Brydie! I am trying to learn how to make as much of our own produce as we can. I even pinned a recipe for how to make salt out of sea water the other day but I am not that motivated yet. I talked to a university lecturer in environmental science a few months ago at a sustainable workshop about eating in season and eating locally. She said that we have it pretty good in Tassie. She and a group of friends and students were doing the locavore challenge and she said that she could get pretty much everything that she needed (aside from spices and some seeds/nuts) from within a 160km range BUT we don’t do a lot of grains here in Tassie and no wheat. It is all imported from the mainland so wheat was completely off the radar for the years duration. She also said that it made her much more aware of the farmers, the producers and the people that are growing her food because she had to go and check them out and find out what they are doing and seek out people that were growing what she wanted to eat. A most interesting and very rewarding challenge. 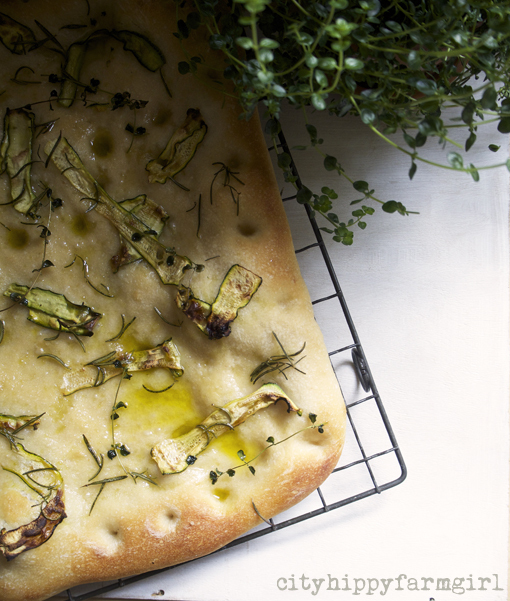 Your foccacia looks awesome. The way my zukes are growing I will be shaving their offspring on just about everything soon. I am not going to waste my zukes this year and I am not going to offload them on my poor long suffering neighbours (there is only so much zucchini that a 92 year old woman can eat! 😉 ) so no placing a carefully and most strategically stacked mountain of zukes on their front verandahs, ringing the doorbell and running away this year! 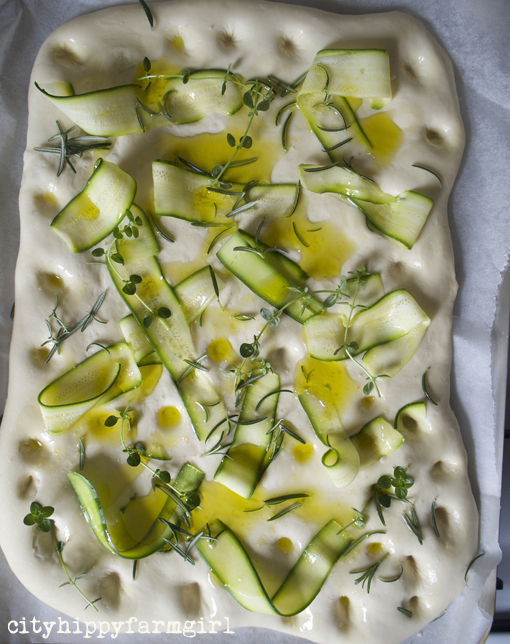 I will be dehydrating slices of zucchini to crisp and powdering it for use in just about everything. I am going to use all of my excess veggies as powdery nutritional goodness to excite my tastebuds over winter 2015. If I could only draw on the imagery I had with your story of strategically stacked zucchinis on 92 year old lady’s doorsteps 🙂 Hahaha! I love the story of your university lecturer eating local too. I have often talked on how Tasmania would be pretty darn good if you had to keep things completely locally produced. As for wheat, what about http://www.callingtonmill.com.au/ ?